Gov. 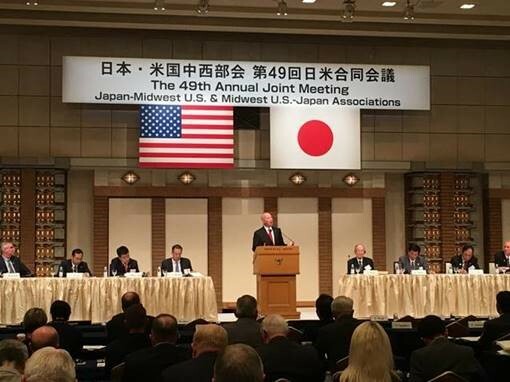 Pete Ricketts is promoting Nebraska’s beef and tourism industries with business leaders in Japan. Ricketts and his trade delegation pitched the state’s offerings Tuesday in a meeting with representatives of Japan’s tourism industry. The delegation provided Japanese tourism officials with sample itineraries with potential tourism stops. Delegation members also met with Japan’s state minister of agriculture, forestry and fisheries to discuss Nebraska’s beef trade with Japan. Ricketts also discussed trade with board members of the American Chamber of Commerce Japan and executives of the Kewpie Corporation, which owns Henningsen Foods, a company that employs 185 people in Nebraska. Ricketts later met with Japan’s state minister of foreign affairs. The trade mission is Ricketts’ second trip to Japan during his term.